Source: Tactical oceanography wide area network (TOWAN) http://www7180.nrlssc.navy.mil/homepages/TOWAN/towanpgs/TOWANDataIndex.html. Note f = frequency; zb = bottom depth; nm = nautical mile. Ocean Acoustic Developments Ltd (1999a) created the WADER global ocean information system, which is based on DBDB5 bathymetry (an OAML database) and the Levitus temperature-salinity data (a NOAA dataset discussed previously in Chapter 2). 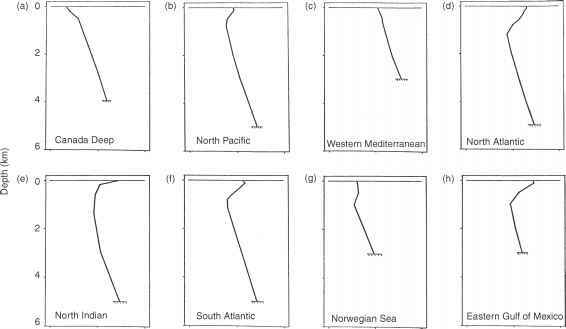 Clancy (1999) and Clancy and Johnson (1997) provided useful overviews of naval operational ocean data products. In particular, Clancy and Johnson (1997) identified and briefly described meteorological models (NOGAPS, NORAPS, LABL), ocean thermal models (OTIS, MODAS), ocean thermodynamics and circulation models (TOPS, SWAFS), ocean waves and surf models (WAM, SWAPS), a sea-ice model (PIPS) and a tide and surge model (TSPS). The meteorological models drive the ocean models, which, in turn, synthesize useful operational products from disparate and spatially sparse oceanographic data. The oceanographic models can then drive underwater acoustic models to simulate sonar performance. Available sonar performance models (subcategorized as active sonar models, MOS and tactical decision aids) are summarized in Table 10.6. Numbers within brackets following each model refer to a brief summary and appropriate documentation. Model documentation can range from informal programming commentaries to journal articles to detailed technical reports containing a listing of the actual computer code. Abbreviations and acronyms are defined in Appendix A. This summary does not claim to be exhaustive. The majority of the active sonar models listed in Table 10.6 are intended for use in ASW scenarios, although four of these models (CASTAR, MINERAY, SEARAY and SWAT) were designed for use in mine-hunting scenarios. Model-operating systems provide a framework for the direct linkage of data-management software with computer-implemented codes of acoustic models, thus facilitating the construction of versatile simulation capabilities. Model-operating systems are further distinguished from stand-alone active sonar performance models by virtue of their ability to conduct sensitivity analyses by computing components of the active-sonar equation using alternative solution techniques. Since sonar model operating systems normally utilize existing underwater acoustic models and standard oceanographic databases, these systems are unique only in the sense of the number and types of models and databases included, and the particular architectures, GUIs and other features employed. Tactical decision aids, a newly introduced subcategory, represent a form of engagement-level simulation that blends environmental information with tactical rules. These decision aids guide system operators and scene commanders in planning missions and allocating resources by exploiting knowledge of the operating environment. 1 Active RAYMODE, which is based on the passive RAYMODE propagation model, also considers surface, bottom and column scattering strengths to calculate reverberation (Medeiros, 1982b, 1985b; Smith, 1982; Naval Oceanographic Office, 1991b,d). 3 ASPM is a system of prediction tools used to predict the performance of active and passive acoustic systems over a wide range of environmental conditions, including littoral regions, in support of system concept evaluation, advance deployment planning, and at-sea operational or exercise support (Berger et al., 1994). 4 CASTAR predicts the performance of mine-hunting sonars (Naval Oceanographic Office, 1999). 5 CONGRATS is an active sonar model constructed in several segments: I - ray plotting andeigenray generation (Weinberg, 1969); II-eigenray processing (Cohen andEinstein, 1970); and III - boundary and volume reverberation (Cohen and Weinberg, 1971). 6 GASS is a simulator/stimulator for air ASW systems trainers. GASS contains an environmental-acoustics (EVA) server that provides underwater acoustic propagation, noise and reverberation characteristics based on US Navy standard acoustic models (ASTRAL and ANDES) and environmental databases from OAML. These characteristics are provided in the form of parameters that control the generation and propagation of time-series signals in other parts of GASS. The models used are range-dependent, and seamlessly support a wide operating envelope in frequency, range and water depth. The EVA server was designed to be responsive to real-time systems and therefore should be suitable for a wide range of other acoustic prediction, simulation and modeling applications (US Navy Air ASW Project Office, 1996a,b). 8 INSIGHT is a PC-based model with a GUI interface. It computes signal excess for both active and passive sonars in range-independent ocean environments. INSIGHT incorporates a full ambient noise model for wind, shipping and rain noise, including propagation effects. The model has recently been upgraded with improved calculations of reverberation for both monostatic and bistatic sonar configurations. INSIGHT does not compute echo level and reverberation in the time domain. Rather, it calculates the associated energy flux density levels and displays signal excess versus target position or other user-selected parameter (Harrison et al., 1990; Packman et al., 1992; Ainslie et al., 1994, 1996; Ainslie, 2000). 9 INSTANT computes transmission loss in range-dependent ocean environments using a hybrid of ray and mode concepts. The formulation is based on the conservation of energy flux and the exploitation of the ray invariant to model weak range dependence (Packman etal., 1996). INSTANT calculates echo and reverberation levels for monostatic and bistatic sonar configurations, although the bistatic option is restricted to range-independent environments. Volume reverberation is not computed in INSTANT. A version of the CANARY noise model (referred to as CANARD) is used to estimate range-dependent noise (Ainslie, 2000). 10 LIRA is an extension of LORA to predict the performance low-, mid- and high-frequency active sonars (Hoffman, 1979). The source and receiver may be separated in depth. 11 LORA is an extension of FAST NISSM, the utility version of the NISSM model. LORA predicts the performance of monostatic active sonar systems, either hull-mounted or towed (Hoffman, 1976). 12 MINERAY was initially developed in the 1970s to predict the performance of submarine minehunting sonars. There are three distinct generations of the MINERAY model. The first generation (1970s) was appropriate for modeling high-frequency sonars in deep-water environments. The second generation (mid-1980s) was extended to allow multipath sound propagation via bottom and surface bounces (Jaster and Boehme, 1984). The third generation (mid-1990s) has been extended to support modeling in littoral environments (Bailey et al., 1997). 13 MOCASSIN predicts the performance of active sonars operating in range-dependent shallow waters that are characterized by highly variable sound-speed conditions (Schneider, 1990). Stochastic sound-speed variability in the horizontal is modeled by a diffusion approximation. Reverberation is computed and stored separately for the sea surface and ocean bottom. 14 MSASM assesses the effectiveness of air-deployed, multistatic-acoustic sonobuoy fields (Navy Modeling and Simulation Management Office, 1999). 16 SEARAY models the acoustic environment by using ray-tracing techniques to determine sound paths in a horizontally stratified water column. The SNR along each path is determined by calculating directivity, absorption, spherical spreading loss and the effects of various noise sources, and then applying the active sonar equation (Tuovila, 1989). SEARAY is derived from the MINERAY model. 17 SONAR is designed to compute eigenrays in ocean environments where the bottom profiles consists of a series of plane segments with slopes entirely in the vertical plane (Marsh and Poynter, 1969; Bertuccelli, 1975). Reverberation is computed using the cell scattering formulation. 18 SST is a set of object-oriented software components and software-development tools for building sonar simulators (virtual oceans) that "sound" like a real ocean to an existing or proposed sonar system. SST-based simulators produce a digital representation of the predicted signal, which includes random fluctuations with controlled statistical properties (Goddard, 1989, 1994). 19 SWAT was developed to support mine-countermeasure (MCM) sonars (Sammelmann, 1998). SWAT actually comprises two models: one for detection sonars and one for classification sonars. The detection model is hosted on a personal computer and is designated PC SWAT. The classification model is designed to run on a workstation and is referred to as SWAT. Inputs and commands are menu driven in PC SWAT. Surface and bottom reverberation are computed by considering the multipath contributions, which are important in shallow and very shallow littoral environments. A three-dimensional, coherent acoustic scattering model of mines is also incorporated. Both PC SWAT and SWAT include the latest high-frequency environmental models (Applied Physics Laboratory, University of Washington, 1994). 20 CAAM is a flexible R&D tool for sonar technologists (Navy Modeling and Simulation Management Office, 1999). It integrates the OAML environmental databases (Naval Oceanographic Office, 1999) together with selected propagation models including PE, ASTRAL and RAYMODE. 23 HydroCAM was developed to predict the detection and localization performance of hydroa-coustic monitoring networks in support of the international monitoring system (Farrell and LePage, 1996). 24 PRISM is an interactive sonar performance model used to evaluate the acoustic performance of mobile sonar systems in various ocean environments. (Chaika et al., 1979). The original version of PRISM contained range-independent transmission loss models including the FACT, RAYMODE, Normal Mode (Newman and Ingenito, 1972) and LORA models. 25 IMAT was developed to integrate training, operational preparation, tactical execution and postmission analysis into a seamless support system (Ellis and Parchman, 1994; WetzelSmith et al., 1995; Wetzel-Smith and Czech, 1996; Foret et al., 1997; US Department of the Navy, 1999; Beatty, 1999). 26 NECTA supports oceanographic and environmental data analysis as well as sensor performance predictions. The open and modular design of the system allows the ready inclusion of additional environmental data and tactical guidance to meet changing demands (BAeSEMA Ltd, 1998).